(Bloomberg) -- Central bankers and finance ministers get another chance to take stock of the global economy, and risks from trade tensions to Brexit, when they gather in Washington this week. The International Monetary Fund, which holds its spring meetings, will also update its global outlook. The question is whether policy makers are still clinging to hopes of stabilization, or if optimism has completely faded. IMF Managing Director Christine Lagarde has hinted at the latter, saying the world is in a “precarious” position. In January, the IMF made particularly dramatic downgrades to euro-area forecasts. The situation looks even worse now, meaning there’s little for European Central Bank policy makers to cheer when they meet in Frankfurt on Wednesday. The same day, the Federal Reserve publishes the minutes of its March meeting, a chance to glean more detail on why Chairman Jerome Powell put U.S. interest rates on a prolonged pause. There have been some signs of progress on U.S.-China trade talks, and Friday’s jobs report was a case of normal service resuming after February’s disappointment. This week sees the release of a U.S. inflation measure along with the University of Michigan consumer confidence index. In addition to the Fed minutes, the central bank’s two vice chairmen -- Richard Clarida and Randal Quarles -- are due to speak, as is St. Louis Fed President James Bullard. 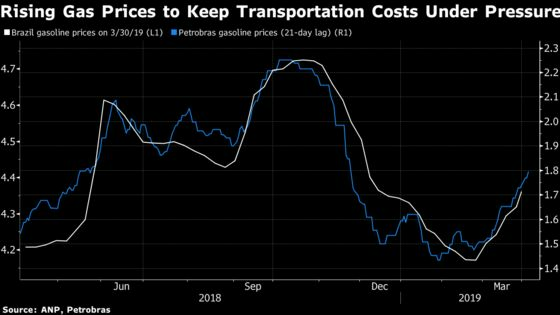 For more, read Bloomberg Economics’ full Weekahead for the U.S. Under the cloud of the U.S.-China negotiations, Asia’s data such as South Korean jobs, Japanese machine tool orders and Taiwanese exports will be scrutinized for clues as to how regional economies are faring amid the uncertainty. Chinese factory price figures on Thursday may show that mammoth sector is again flirting with deflation, while export numbers on Friday are expected to indicate a modest rebound after February’s holiday-related slump. With the slowdown ongoing, ECB officials may hold off providing fresh details on their new loan program until they have more clarity. Investors will be focusing on any clues on what President Mario Draghi meant when he said policy makers should look at ways to soften the impact of negative rates. 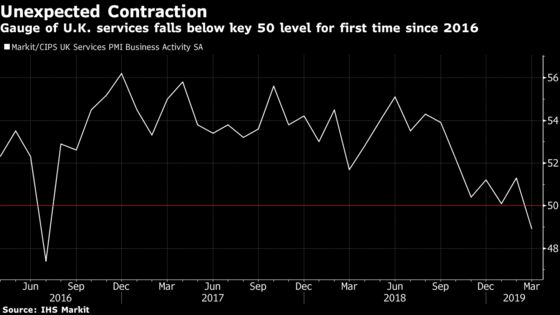 In the U.K., monthly GDP for February will help illustrate the state of the economy during the first quarter when companies were preparing for the threat of a no-deal Brexit -- a danger which hasn’t yet gone away. Purchasing manager indexes suggest heavy stockpiling by factories and a slump in sentiment in services. Israel’s central bank is expected to keep its base rate at 0.25 percent when it meets on Monday, a day before the general election. Turkey watchers will be paying close attention to President Recep Tayyip Erdogan’s meeting with Vladimir Putin in Moscow on Monday, as the U.S. ratchets up pressure on Turkey to back off from a purchase of Russian missiles or face economic sanctions. 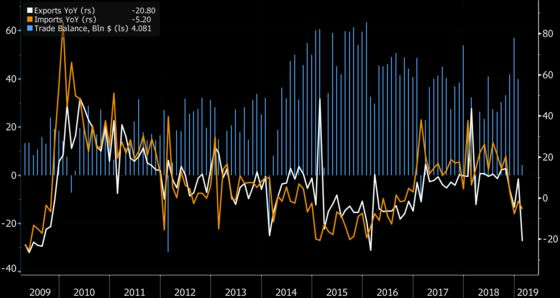 Weekly Thursday data releases on capital flows in Turkey have suddenly gained importance amid massive dollar purchases by locals, outflows from foreign investors and a rapid draw-down in central bank reserves. Brazil’s monthly inflation figures are due out on Wednesday, while in Mexico the central bank will release the minutes from its March meeting a day later. The statement may offer clues as to whether an interest rate cut is in the offing. Peru is expected to keep its benchmark lending rate at an eight-year low when its central bank board meets Thursday evening.